Will CAD/JPY Close Above 105? For the next 24 hours we have our eyes on CAD/JPY. This evening Bank of Japan is scheduled to release the minutes from its most recent monetary policy meeting and since this was the meeting in which they surprised with more stimulus, investors will be watching the report carefully to see if it suggests that the BoJ will ease again. We expect the minutes to be pessimistically dovish, which on this holiday shortened trading week with low volume could lead to a larger decline in the Japanese Yen. At the same time, we expect Tuesday’s Canadian retail sales report to show an uptick in spending. Not only has job growth been healthy but wholesale sales also increased nicely in October. Today and Friday, CAD/JPY pierced but failed to close above the key 105 level. If the tone of the BoJ minutes and Canadian retail sales reports are as we expect, CAD/JPY should receive a nice boost that would take it comfortably above 105. Taking a look at the monthly chart, if 105 is broken, the next major level of resistance for the pair will be 107. 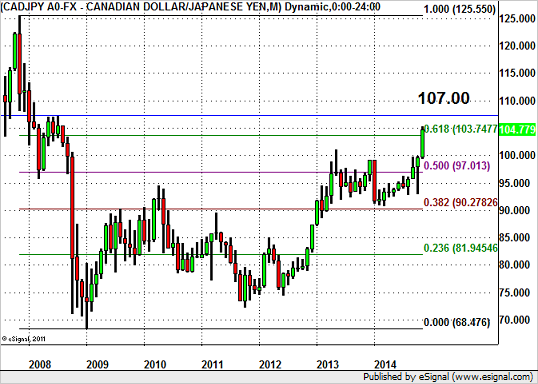 On the downside, 103.75, the 61.8% Fibonacci retracement of 2007 to 2009 decline is support for CAD/JPY.